Farewell to the PARK – Not fit for purpose, but still needed? Capturing lessons learned and sharing good practice is often hard to find time to do systematically in the busy world of humanitarian needs assessment and profiling practitioners. How can we best learn and exchange experience from different contexts, share tools and concrete examples between practitioners? What are the best mechanisms for facilitating this effort with the aim of improving the quality and effectiveness of evidence produced? 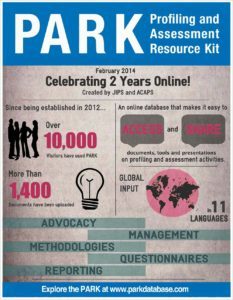 Back in 2011, in collaboration with ACAPS, JIPS developed the PARK platform, to address this specific challenge. The Profiling and Assessment Resource Kit (PARK) – a first-of-its-kind – gathered valuable resources on displacement profiling and coordinated assessments in a single online platform. However, due to developments in the sector since then and the very practical challenges of managing several online platforms, we have decided to shut down the PARK. At the time, needs assessments, IDP profiling and related large-scale data collection activities in displacement and other crisis settings demonstrated significant knowledge gaps. There was a general lack of consolidated technical guidance and authoritative examples of good practice. Documented methodologies and examples of tools used in practice were hard to find, whilst practitioners were repeatedly asking for them. This reality quickly became clear to teams at both ACAPS and JIPS that were dedicated to building the capacity for profiling and assessment work across the sector. The PARK was designed to fill these very gaps. It provided an online space to easily collect and systematically store the wide variety of documents, tools and resources that NGOs, humanitarian clusters, governments and other humanitarian and development partners were using in their data collection exercises. Patrice Chataigner, who was responsible for methodology and analysis in ACAPS at the time and co-led with William Chemaly (then Coordinator of JIPS) the development of the PARK, remembers the groundbreaking nature of the tool. For him, it was the first of its kind and, it “considerably contributed to making valuable documentation, tools and templates for assessments accessible to practitioners looking for good practice”. 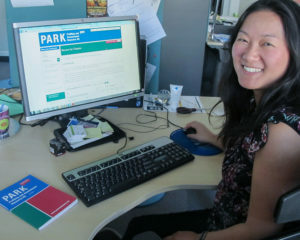 The PARK’s aim was to create a collaborative digital repository where users – over 650 on average every month – would be able to easily find tools for each stage of the profiling/assessment process, rate each tool against their usefulness through a star-based system, and share selected tools via email with themselves or their colleagues. It also enabled practitioners to upload new examples, contributing to this shared resource – or “gold mine” as one user called it – which they did regularly from a wide range of contexts thus promoting collaboration and information sharing. “Needs assessment experts are passionate about their work, and the PARK was the place where they could share their love of research, accuracy and precision”, recalls Patrice Chataigner. 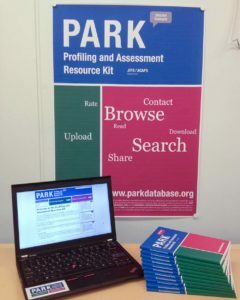 The library of tools – the PARK Database – was also accompanied by a step-by-step guide in both French and English – the PARK Companion – which aimed to demystify the sometimes overwhelming profiling/assessment process into concrete manageable steps to follow and a check list of key tasks to remember. The then Global Protection Cluster Coordinator and Director of IDMC launched the PARK in 2012, alongside staff from ACAPS and JIPS. The platform was well received, recording over 1,000 users per month for the first three years after it went live. Shared through various channels under the leadership of Assanke Koedam, then Head of Information Management at JIPS – events, trainings, retreats, websites and newsletters – the jointly managed user-driven platform effectively reached a wide audience of practitioners. Beyond its own usage, the PARK’s innovative structure, inspired several other online toolkits including UNHCR’s Information Management Toolkit. No longer fit for purpose, but still needed? The sector has professionalised and with that made efforts to standardise practice. Many have developed their own toolkits for profiling and assessment work that direct practitioners to vetted or preferred tools. These include assessment toolkits for different humanitarian clusters, a new UNHCR Needs Assessment Handbook from 2018, a newly launched DTM toolkit launched at the 2019 HNPW. In addition to toolkits, repositories of assessments (mostly assessment reports) to support coordination efforts and reduce duplication have also been established for many operations. And countless online training opportunities, dedicated and very active Skype and Slack groups, amongst practitioners proliferated. The sector is refocusing or rethinking some key tenets of its work, inspired by commitments within the Grand Bargain. These include an emphasis on joint inter-sectoral analysis (not only joint data collection processes) to enable evidence-based decision making and prioritisation, and embracing common principles for coordinated assessments including commitments to open data, the introduction of criteria for the quality review of needs assessments amongst others. The PARK itself became difficult to maintain and manage. Over several years, the website accumulated over 3,000 documents, offering a vast amount of information to practitioners from various sectors. However, it became increasingly difficult to curate the rich digital resource base, let alone identify the best quality documents or best country practice within the library. Users increasingly wanted to quickly find ‘expert-vetted’ tools to adapt to their context. However the process of identifying good practice was not facilitated by the PARK, which was created to crowd source such a judgement over time. Moreover, the criteria for identifying good practice is, in reality as much a matter of technical expertise and sectoral/institutional perspective as it is one of simple preference. As Caroline Draveny, now Head of Communications at ACAPS, explains: the PARK “was an enormous resource, with many, many documents. Many practitioners would be very happy to have all this material to look at. However, for people in a rush, like those working in the humanitarian field where you’re often under time pressure, having too many options can be overwhelming and, in the end, I think undermined the purpose of the platform.” Thus, in more recent years, user numbers started to decline. While each practitioner works with a preferred set of tools, it is often the decisions taken to modify those for the specific realty of the context that are the most valuable resource to share. For practitioners working on collaborative profiling processes in protracted displacement settings, we worked to address the gap through our recently refreshed JET, where guidance and templates for each stage of the profiling process can be easily downloaded. Most of the resources that colleagues had uploaded to the PARK since it was launched in 2012 resulted from real data collection exercises in various displacement and crisis contexts around the world: the database contains valuable lessons that we can all learn from to improve current practice. To make sure this resource is not lost, we have been working to scan through the database to locate key documents and organise them through an updated tagging system, including document type, phase in the profiling/assessment process, type of assessment etc. We are also in discussions with partners in the information management/needs assessment community, including OCHA’s Data Centre in the Hague, UNHCR and members of the Needs Assessment Grand Bargain Workstream, to explore new ways of sharing the results back with the community in a more targeted and meaningful way. Did you use the PARK platform for your work? What kind of tool would you like to see taking its place? We would really like to get your feedback: get in touch at info@jips.org or find us on Facebook, Twitter, or LinkedIn.